My husband, my son and I just came back from a quick, but delightful, weekend in Park City, Utah. My son has 2 (!) weeks off for spring break and my husband and I do not have 2 weeks off LOL. We scooted away for a long weekend and I’m so glad we did. It’s so important and enjoyable to spend quality time together, especially when it’s outdoors in the fresh air, disconnected from our devices. But I have a very busy week ahead and now it’s back to business. I am starting a new menu in my classes this week and I also have to start preparing for Passover. When I married my husband 22 years ago, and I had to keep Passover for the first time, it was no picnic. There were hardly any gluten-free products, let alone grain-free products on the market. I just followed what my husband did, which was to eat loads of matzoh and make Maneschevitz boxed coffee cakes every day. Yuck. Now, it is almost easy to keep Passover with all the grain-free, Paleo and Whole 30 recipes out there. 20 years ago, I had never heard of almond flour, coconut flour, tapioca flour and no one was making pasta out of anything other than wheat. Honestly, we don’t look at Passover with as much dread as we used to. And I’m not sure if we’re missing the point, but I’m not going to argue with grain-free muffins. And if it wasn’t easy enough with all the new products and recipes, last year the rabbis in charge of laying down the Jewish law declared that legumes, rice and corn are now acceptable Passover foods! Hello, sushi! Hello, tacos! And bringing legumes back into the mix opens up a world of lentils, beans, peanuts and peas, and if you haven’t noticed, there are a TON of products being made out of legumes. 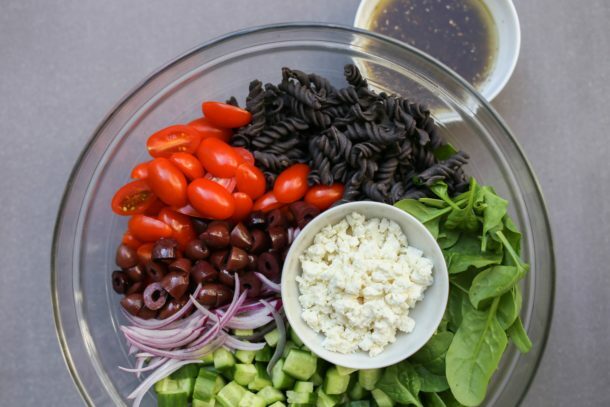 Which brings me to this Greek Pasta Salad recipe, which I have made here with black bean pasta, which means….you can eat this during Passover! I know! It’s crazy town, but let’s not argue with the Rabbinical Assembly. And if you don’t keep Passover, you can eat this with whatever kind of pasta that you want. It would be perfect for a meatless Monday meal or a Lenten Friday meal. 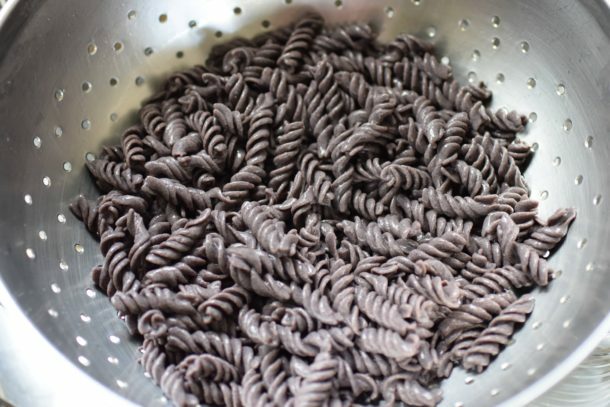 But let’s talk about black bean and other legume pastas, which are obviously gluten-free and grain-free, but also higher in protein and fiber than wheat pastas. Many of my students kept asking me how to cook them properly and how to get their families to like them. I’ll admit, legume pastas sort of taste a little like the bean or lentils they are made from. So I find combining them with stronger flavors like pesto, spicy sauces, or this Greek vinaigrette are the way to go. I had amazing feedback from my students with this recipe! The other key is cooking the pasta perfectly. Legume pastas, like gluten-free pasta, can turn out underdone on the inside and overdone on the outside, or, according to one of my students, disintegrate completely and turn into bean sludge. Yikes! Here’s a post on how to cook gluten-free pastas and basically the secret is to turn the heat off after 6 or 7 minutes and allow the pasta to continue to cook in the hot water without it boiling. This allows the pasta to maintain its shape and cook it to the tenderness you desire. It’s also helpful to keep testing (by eating it) the pasta as it sits there. 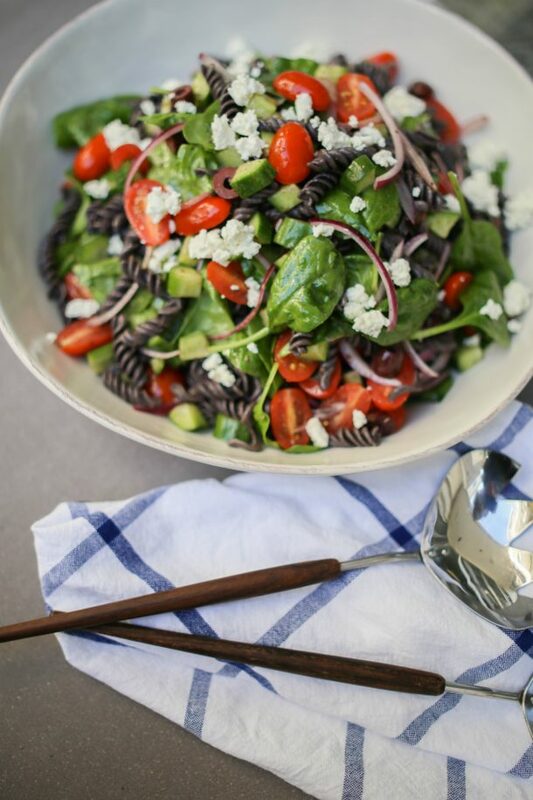 This pasta salad is zesty, healthful and like a hearty Greek salad. If you don’t want to include feta, sub avocado or just omit it altogether. I like to serve this as a meal since there’s plenty of protein here and lots of veggies. Leftovers are perfect in school lunch boxes! Cook pasta according to package directions, making sure not to over cook. For gluten-free pasta, I like to turn the heat off just before pasta is cooked and allow it to sit in hot water until perfectly al dente. Rinse pasta with cool water and set aside to drain well. Meanwhile, make the dressing by combining all ingredients together in a small bowl or glass jar and mixing well. 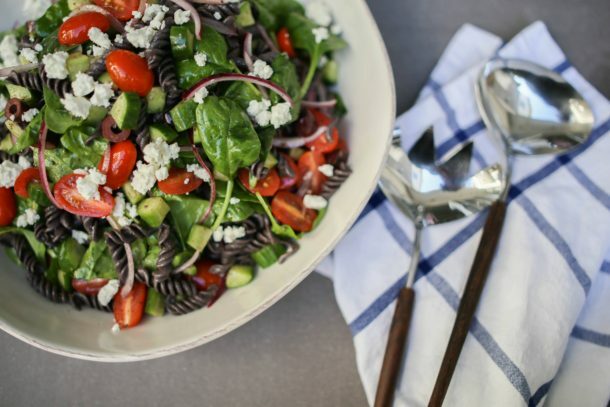 Combine pasta in a large bowl with remaining ingredients and toss to coat with dressing. 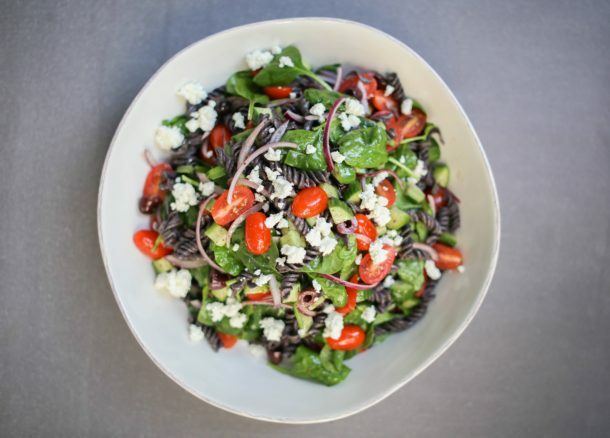 How long can you let the black bean pasta sit before adding it to the salad? I would like to make this for a lunch but need to do some of the work ahead of time. thanks! As longs as it has been rinsed and cooled after cooking, you can let it sit for several hours at room temp.